A few weeks ago, I discussed five reasons why you should consider using Windows Live Photo Gallery. It's my favorite free photo editor and organizer; I really like the overall design of the program, which makes it easy to organize and find photos quickly. And Photo Gallery's extras--like Photo Fuse and panoramic stitching--are superb. But several readers asked me how Photo Gallery stacks up against another popular free photo organizer/editor: Google's Picasa. So this week, let's take a look at the latest version of that program. 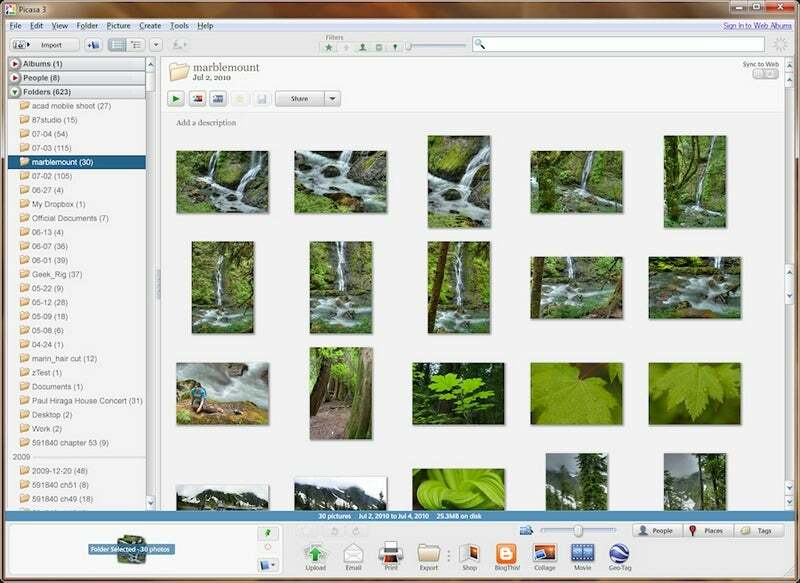 Like Windows Live Photo Gallery, Picasa doesn't actually move or copy your photos; it simply provides a convenient way to see the photos that you have on your PC. If you tend to think about organizing your photos in terms of folders, you'll like Picasa, because while the program does support tags, it feels like a folder-centric program. You'll see all the photo folders on the left side of the program window, arranged by year. That said, you can also turn on the right-side tag pane (Choose View, Tags from the menu) and enter tags in the field at the top of the screen. As you type, Picasa suggests existing tags to make the job easier. 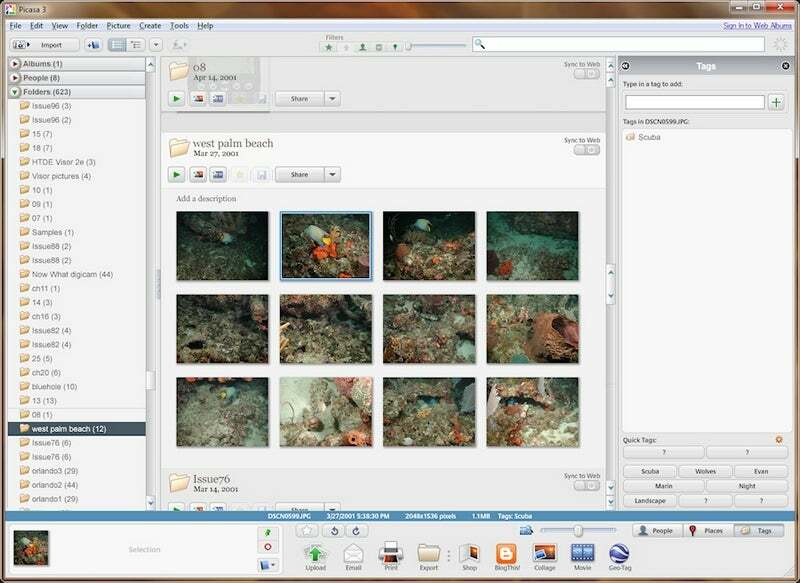 You can also configure ten quick-tag buttons that let you assign your most common tags to photos with a single click. Unlike Windows Live Photo Gallery, though, you can't easily choose tags from a list to zero in on photos--you have to know the tag and type its name into the search box. These days, there is no shortage of superb editing tools available for free. Web-based photo editors like FotoFlexer, Splashup, and Picnik can very nearly take the place of Adobe Photoshop for most people, in fact. Even by those standards, Picasa has a good collection of editing tools. You can crop, straighten, remove red eye, tweak color and exposure, and fiddle with color cast and white balance. You can also add special effects like sepia and soft focus. 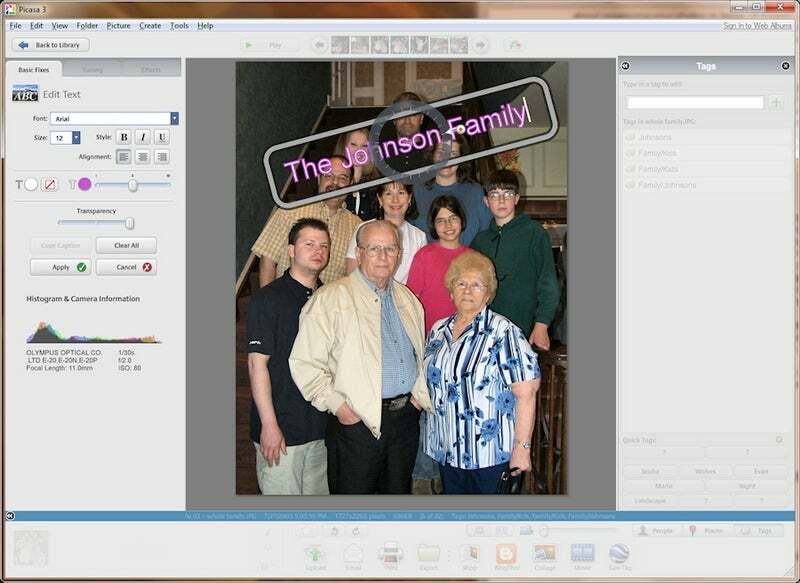 And unlike Windows Live Photo Gallery, you can add text to your photo, which is handy for adding a caption or indicating the date the photo was taken. Like Windows Live Photo Gallery, all of these edits are completely nondestructive to the original photo. That's great, but the way Picasa protects your photos is quite different, and the distinction is worth noting. In Windows Live Photo Gallery, any time you make a change to a photo, those changes are visible both in Photo Gallery and in Windows itself, so any program can take advantage of your edits right away. The original photo is tucked away in a hidden location, so you can revert to the untouched original any time. Picasa, however, doesn't change your photo: Your edits are available only from within the "walled garden" of Picasa. If you want to work with a photo outside of Picasa, you need to manually save those changes via an extra step. When you do that, Picasa saves the photo as a new file, putting the original in a backup folder. Personally, I prefer the way Windows Live Photo Gallery handles nondestructive editing, but both methods do fully protect your photos. You've got a lot of photos with people in them, and Picasa is here to help you sort them all out. Like Windows Live Photo Gallery, Picasa does a good job of identifying the presence of faces, and, once you tell it who a few of them are, it automatically groups them for your approval. The more people you identify, the more accurate it gets. Picasa has a lot to recommend it. I like the batch editing feature that lets you work on a group of photos at once, for example. And there's a poster mode that can print your photo across a grid of pages to make an oversized image, suitable for hanging in a dorm room. The collage creator makes an attractive scramble of photos, as if you shuffled photos on a tabletop. But I have trouble getting past some of Picasa's annoyances. The program doesn't support the mouse's scroll wheel, for example, so you can't zoom or scroll around using the mouse in the same way that I'm used to in other photo editors. And be careful when you first configure the program, because by default, it scans all the folders in your user profile, including your Documents folder. Sure, you can turn that off, but if you miss that step, you end up with every tiny image you ever used in a business document in Picasa's photo library. That said, Picasa is a solid organizer and editor. 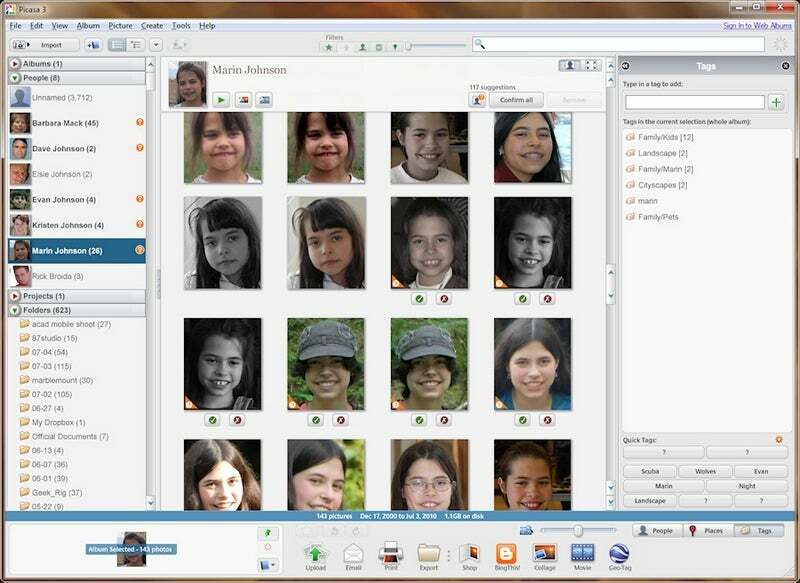 But since programs like Picasa and Windows Live Photo Gallery essentially duplicate each other--and offer features like face identification that take a lot of effort to set up--you really do need to choose one or the other. On the plus side, you can try both and uninstall the loser--they're both free. 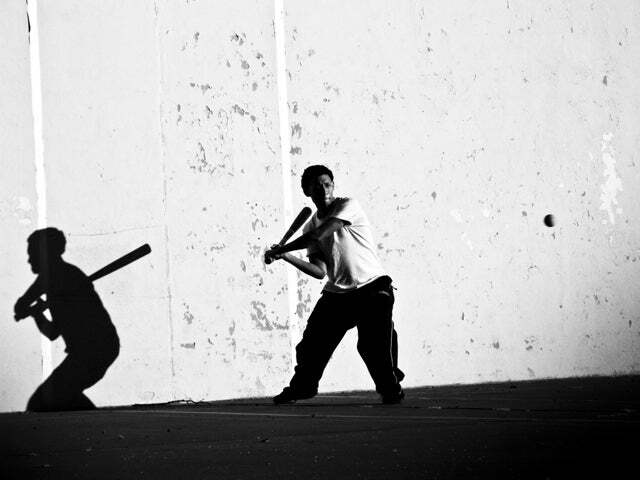 Christopher says: "I took this photo of a teenager playing baseball in the South Bronx using my FujiFilm FinePix S9100." 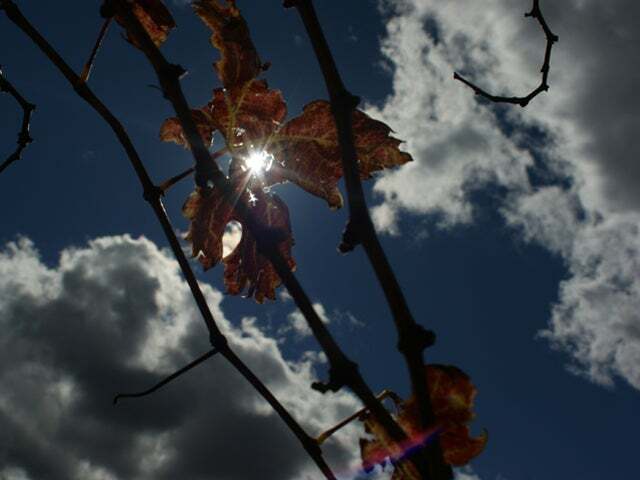 This week's runner-up: "Arizona Winter Morning" by Robert O'Donnell, Mesa, Arizona Robert used a Song Alpha A350 to take this photo of the sun through a grape leaf in his backyard. To see last month's winners, visit the July Hot Pics slide show. Visit the Hot Pics Flickr gallery to browse past winners.